Scorching summer heat plagues Elyria and the people suffer. The High-Council of Elyria (which consists of Demadrend and his sock-puppet adviser, Kami du Fafa) have been fretting over what to do! Then Chief-Librarian Goldred discovered an Ancient Tome of meteorological events and the secrets within. Apparently 2.000 years ago, a band of Witches from the beyond the unexplored Southern Deserts arrived and tried to seize control of the land that is now Elyria by summoning a terrible heatwave. Crops withered, sheep and cattle died, the people grew sick and frail. The Witches then acted as Saviours, offering to end the drought as long as they would be allowed to take seats on the High-Council. You will have a total of 4 events, each of which can earn you 30 points (max.). The plan below details when each event begins and ends. A chance-based Bonus event will follow to give those who missed or failed an event to try to reach 120 point (the max.). 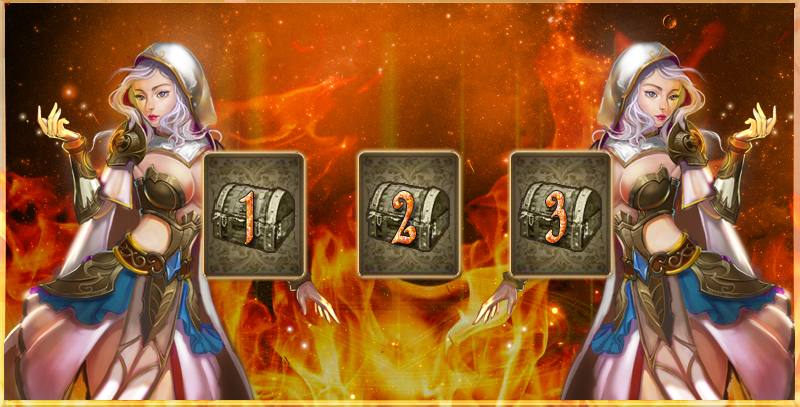 Rewards will be awarded based on the number of points earned at the end of the event. The rewards are thus awarded in increments of points and they are obviously non-cumulative. You have set off on your journey to protect Elyria, find the source of the unbearable heat and challenge those who are causing it. Days go by as you slowly meander south and as you go, the landscape worsens and worsens. Green fields turn to brown, ponds and streams thicken with green algae or turn to dry and cracked mud. The air chokes with dust and smoke on the horizon signals fires out of control. Eventually you come to a once bustling pastoral village, now a charred and blackened ruin. A few miserable and sootened villagers mill about, half-heartedly trying to recover valuables and begin cleaning the mess. You stop to ask a local if they have seen any Royal Troops pass by in previous weeks or months. "Aye, we saw them shiny glorified tin-men pass through, aboot 6 week ago. They even handed out sum autographs like they werr famous or soo. Think I still got 'em sumwerr....aye, here y'are, abit singed but...mayhaps you recognise 'em?" Will you be able to know which creatures hide behind these shadows? Resting for the night in a Town encountered along your journey, a sudden cry is heard. The Grain Store has caught alight but how? There are no forest fires nearby...fortunately your entire party makes it out, but some others are still missing. Identify the missing Townies from the pictures below! Rules : Will you be able to know which creatures hide behind these shadows? Chasing the source of the arson-attack, you encounter some cowled and hooded people. "Prepare to face Judgement!" you exclaim. In answer, each Witch reveals her face and a strange glow begins to emenate from their eyes and hands....battle is about to begin. The skirmish ebbs and flows, but each Witch is very strong in the arcane arts. They are powerful and you are called upon to remember your training, venturing deep into the dark places of the world to challenge other powerful Bosses! Battle the "Desert Fortress" boss and collect 3x Insignia of Wisdom (Rare or Epic). Rules : Will you be able to steal 3x Insignia of Wisdom (Rare or Epic) from Elfic witch ? Victorious in battle, you scan the battlefield for survivors. A heavy butcher's bill was exacted on both sides. Kathryn Emberwind, however, appears to have escaped. "Sir, we got a live one!" Before you lies a cowled Witch, bleeding and breathing heavily. "Stabbed through the guts, she's a goner...let's see if we can get any intel from her before she passes"
Some cajoling and pressing questions later, you are informed that Kathryn has probably retreated to her lair, a great Tower reaching to the sky, from where she can influence the weather. Starting from Level 1, ascend to the top of the Ascension Tower (Level 50). Rules : It's time to run up to tower and found the Water Crystal and save Elyria from Fire ! With Kathryn defeated, she can no longer channel her energy to the 3 magical Pylons in front of you. The weather should eventually return to normal, but the glow and crackling-sounds emanating from the arcane devices signifies they are still active and will suppress cloud-formation for some time yet. You notice each Pylon has a small hatch about halfway up it's structure, with what appears to be a key-hole. Suddenly behind you, Emberwind is engulfed in flames....her dark spirit returning to wherever it came from...her physical remains quickly blacken and turn to ash. All that is left behind is a Crystal-Key. You have the sense that this Key only has one use...so choose wisely, and find the Main Pylon containing the Water Crystal. Will the luck be on your side ? 1 chest will give you the Water Crystal and 30 pts. 2 chests will give you a little tear and 10 pts. The Pylon / Chest n°3 was the Water Crystal ! My eyes are bleeding but we made it, everything is collected thanks to amazing excel skills of Goldred and you will have your final score on the PDF file below. I hope there is no mistake but i'm still human and got red eyes, so we never know, check and told us by private message if something seems strange. I will wait until 12:00 before sending anything to Dema. Hope you enjoy a lot this event made by Shin & myself, managed with the precious help of Goldred. It was a true pleasure for us to meet you all ! Rewards have been sent ! I have sent the last version with correction to Dema' for players who didn't received anything. If you check and saw a mistake, please could you send a message to Demadrend about it ? He will check with me if there's anything to do. Hope you will enjoy it and have a nice week-end too !